Amazon.com Inc. is looking at new food technology that the U.S. military first developed to produce tasty meals that do not require refrigeration, as the e-commerce behemoth searches for new ways to squeeze into the U.S. $700 billion grocery business. The largest online retailer in the world has talked about selling dishes that are ready to eat like a vegetable frittata and beef stew as soon as 2018, said officials from a startup company that has been marketing that same technology. The different food dishes are easy to keep large inventories on hand and ship since no refrigeration is required and could be offered inexpensively in comparison with takeout food from restaurants. If the food technology can be developed to Amazon’s needs, and it implements the same on a large scale, it would mean a huge step forward for the e-commerce giant as it attempts to attract more grocery customers shifting toward easy and quick meal options at their homes. Delivery of meals would help AmazonFresh service that has been in the grocery delivery business for almost a decade. It could complement the planned purchase by Amazon of $13.7 billion of Whole Foods Market and the checkout-free store of Amazon that is currently in a test stage. The pioneering technology for food-prep, called microwave assisted thermal sterilization (MATS), was first developed by Washington State University researchers and a startup that is venture backed known as 915 Labs is bringing it to market from its base in Denver. The MATS method involves putting food that is sealed in package into pressurized water then heating them several minutes with microwaves, said 915 Labs. Unlike the traditional methods of processing, where pressure cookers are used for as long as an hour until both nutrients and bacteria are close to being gone, the dishes keep their texture and natural flavor, a spokesperson for 915 Labs said. The packages of food can also sit for a year on the shelf, which would be suitable for the storage and delivery service of Amazon. MATS machines can produce as many as 1,800 food packages per hour. 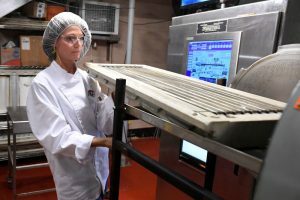 The technology of MATS grew out of the efforts by the Natick laboratories of the U.S. Army over a decade ago in an attempt to improve the food quality for combat soldiers. WSU received funding from the U.S. and became the MATS research hub.